Easy Hi-Q Recorder records directly to: MP3, (Constant Bitrate: CBR or Variable Bitrate: VBR), Windows Media Audio (*.WMA) 9, (Windows Media Audio 9), WAV or OGG Vorbis. 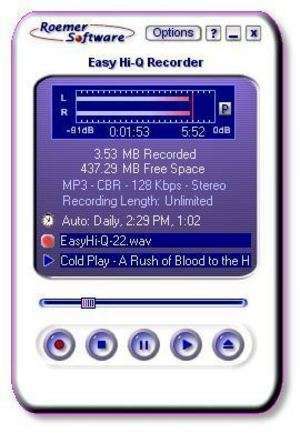 Easy Hi-Q Recorder 2.5 is a shareware program and can be used as a demo to try the software until the free trial period has ended. A full version of the program is available after the trial period ends. For security reasons, you should also check out the Easy Hi-Q Recorder download at LO4D.com which includes virus and malware tests. Additional screenshots of this application download may be available, too. Easy Hi-Q Recorder has a presence on social networks.